Samir Rafi (1926 – 2004), born in Cairo Egypt at so called “Sakakini district”. His sharp mind impressed both his family and his school teachers at an early age. Rafi was the student of the pioneering late artist Hussein Youssef Amin who strongly believed in Rafi’s talent. Amin decided to organize Rafi’s first exhibition in 1943 when he was 17 years old, the exhibition took place at the Qattan Library in Cairo. His exhibited painting that was titled “Seashell” was selected to be part of the art collection art the Art Museum of the Ministry of Education. Amin created a path for talented artists to follow and encouraged them to join the Contemporary Art group which he co-founded along with Rafi in 1964 thus increasing Rafi’s contribution to the development of art in society. 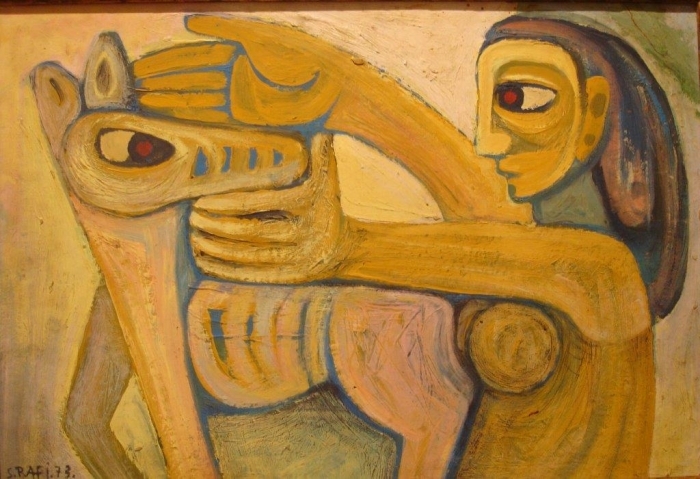 He was the top of his class at the Faculty of Fine Arts where he graduated,1948. After a year, he received a diploma from the Institute of Education. Rafi was a member at the “contemporary Art Group” which was founded by Artist, Philosopher and thinker “Hussein youssef Amin, in 1940. Amin was his mentor who drew this new member’s attention to surrealism. 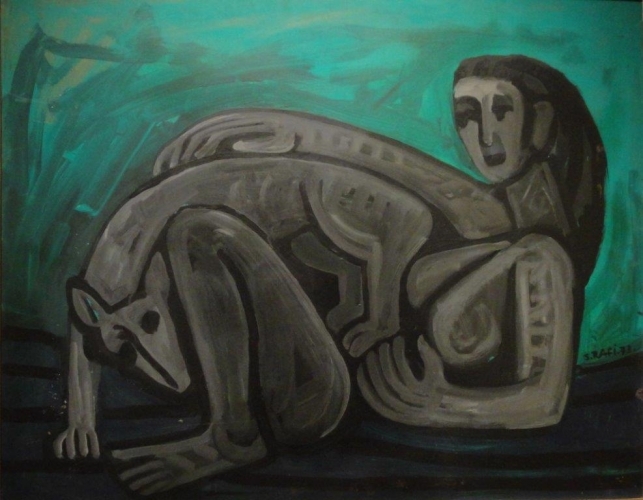 Rafi quickly gained a strong foothold in the art community in Egypt throughout the 50’ies. 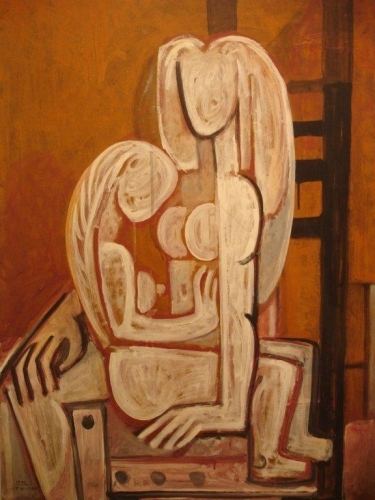 In addition to painting, he experimented with great verve in printmaking, decorative art and fold art. Rafi was altogether an artist, a thinker, a philosopher and a writer. . 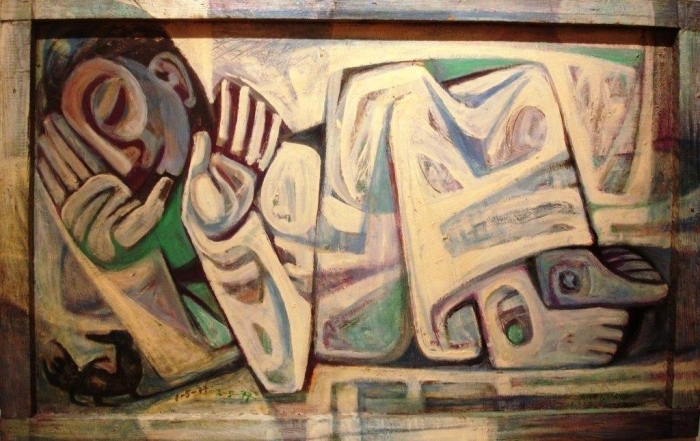 In 1953, he wrote an illuminated article in which he explained the influence of the Egyptian revolution in 1952 on his art. During the fifties, Rafi was an apprentice to renowned french sculptor and painter, Andre Lohte (1885 – 1962), who was very influential as a teacher and writer in art and lectured extensively in France, Belgium, England, Italy and, from the 1950s, also in Egypt and Brazil. 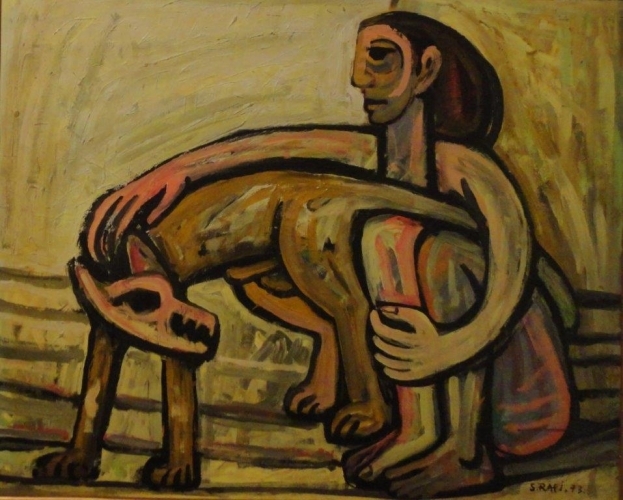 Due to his clear minded political and intellectual vision, Rafi’s artwork is widely considered to be an important sequel to the Egyptian and Arab art movement. His paintings are epics giving rise to a metaphysical world sprinkled with signs of melancholy and homesickness. During his uninterrupted 50 year stay in Paris. Rafi curiously shunned publicity. The introverted artist led a life of loneliness with his art and thoughts.